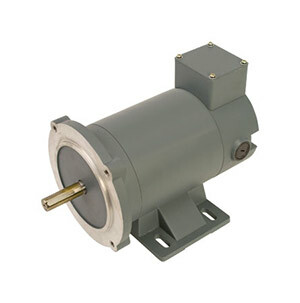 OMPM-DC Series permanent magnet DC motors are designed for long motor life with permanently lubricated ball bearings and are TEFC (totally enclosed fan cooled) or TENV (totally enclosed nonventilated). All OMPM-DC motors are constructed from heavy duty gauge steel including frames, endbells, mounting bases, junction boxes and covers. These DC motors are specifically designed for use with SCR controllers where applications require constant torque throughout the application speed range, as well as adjustable speeds. The DC motor voltages available are 12, 24, 90 and 180 volt. All OMPM-DC motors are NEMA 56C flange mounted and come with a removable base and a one year warranty.